Pedestrian critically injured in hit and run in Kensington. Gray Hall reports during Action News at 6 a.m. on October 13, 2018. 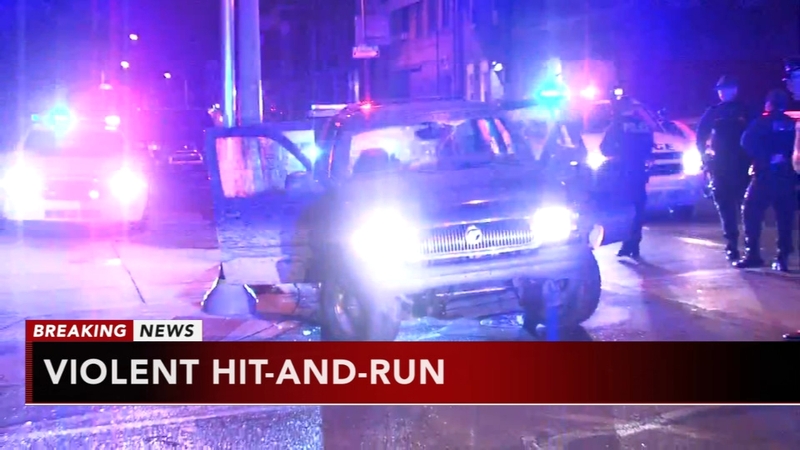 KENSINGTON (WPVI) -- Philadelphia police are investigating a hit and run accident that left a man critically injured. The incident occurred around 4 a.m. Saturday morning on the 3200 block of G Street near Allegheny Avenue in the city's Kensington section. Police say the 32-year-old victim was crossing at G Street when he was struck by an SUV. He was dragged 50-feet by the vehicle, police say. An hour later, police on patrol spotted what's believed to be the SUV involved at Frankford and Cambria streets in the city's Frankford section with three males inside. Police are questioning those males.